With the new Canada’s food guide out, I review the criticisms of past guides and whether this new guide lives up to the hype. Back in the summer it was announced that Health Canada would be taking the official Canada’s Food Guide back to the drawing board to give it a well needed makeover. There were rumours that dairy and meat were going to be downplayed or removed, and that there would be a discussion of not just what to eat, but how to eat. In our previous post, we went into a big of the history of the Canadian Food Guide, so to read a little background you can click here. Last week, phase one of Canada’s Food Guide was officially launched, and dietitians everywhere were glued to their screens as they unpacked it all. While a lot of dietitians talk about the food guide with disdain, I think there was a bit of a sigh of relief when we opened our computers to take a peak. 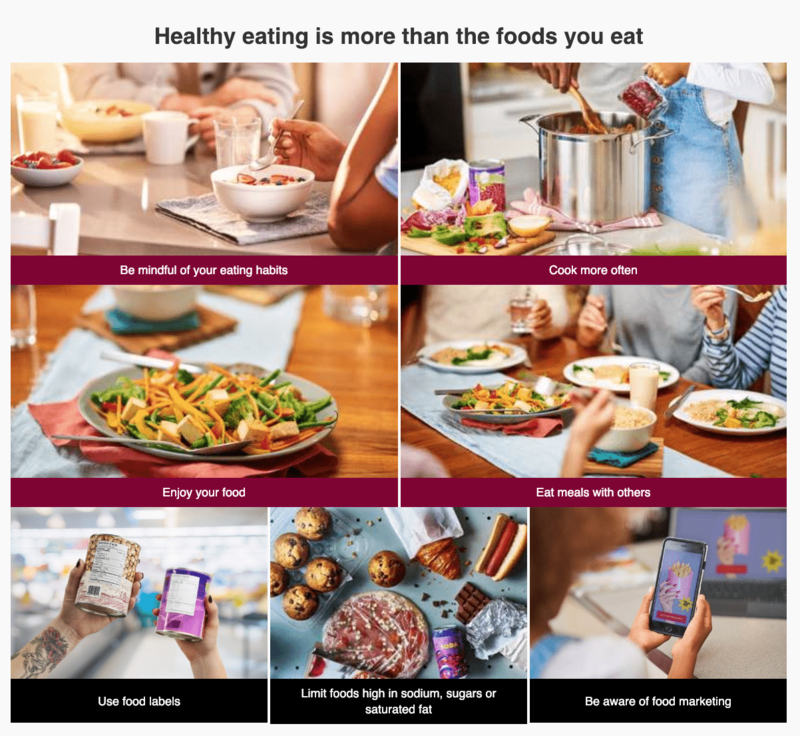 After so much discussion and planning, Health Canada delivered a modern take on healthy eating that goes beyond just what we put on our plate. Compared to past food guides, the new food guide took a whole new approach to healthy eating and what I would suggest is a giant leap in the right direction. 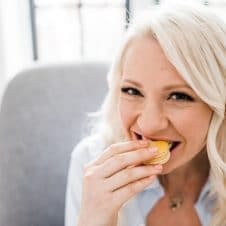 So I thought we would review my old post on what I (and many other dietitians) disliked about past food guide and whether this new food guide addressed those issues. A major criticism is that the old food guide prescribed way too much food. The recommendations were unrealistic for the average consumer which led people and even health professionals to avoid using the guide as a counselling tool. I myself once experimented with the recommendations and found myself eating SO much more food than I was comfortable eating. Goodbye food prescriptions! There are NO recommended “servings” (more on that later ) anymore in this new guide. Which means no unachievable unrealistic goals that a lot of Canadians can’t reach. Instead of a ghetto looking rainbow or a chart to follow, the new guide keeps it simple by showcasing a plate with food. This is more accessible and familiar to people because we eat on plates, not on a colourful rainbow. Many people also claim the food guide is too long, and because of that, the messages are less effective and convoluted. The language used here is short, simple and easy to understand, so the hope is that people will be engaged enough to actually read the content. 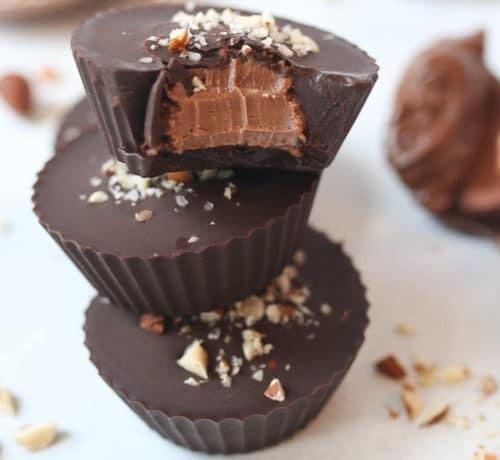 Serving sizes also tend to be confusing and inconsistent as they’re offered in cups, ounces, teaspoons, and more, all just randomly dependent on the type of food and what the food manufacturer decides best fits his audience (or … makes his nutrition label look more favourable but that’s another post). The reality? Most people are not measuring out their food and have no freaking clue what a “serving” looks like (despite educational efforts) so this becomes a major barrier to use. Ha, I am even a numbers person and I HATED trying to remember this seemingly random chart. It was especially confusing (even for health care professions) when a serving size could be dependent on whether or not the food was cooked vs uncooked, how it was cut, and how it was served. Yes, I get that the food guide was meant to be a guide, but people’s individual needs are SO inherently variable, even from day to day, it felt a bit “diet-y” to me. I am so happy to finally say goodbye to serving sizes. Including serving sizes in the old guide made the pamphlet look really busy and I think overwhelmed most Canadians. While the new guide does offer some suggestions by recommending a “plate” method of conceptualizing meals, it leaves the serving sizes and numbers of servings up to individual interpretation. More later on whether or not that is enough. New Canadians are arriving every day from all over the world, and the old food guide was not representative of this. For example, a lot of cultural groups do not drink milk, so a food guide telling them to drink two glasses of milk seemed really out of touch. As another example, a lot of groups are more likely to eat rice for breakfast than refined cereal, but again, this information wasn’t so easily accessible in the guide. So with regards to the the example I used above with the milk it may look like the guide is moving in the right direction since milk is no longer front and centre in the guided. With that being said, the new guide does not seem to showcase any cultural foods or traditional foods to certain cultural groups. I find this surprising given that according to Statistics Canada, “one out of 5 people in Canada’s population is foreign-born”, so a food guide that is made for Canada should reflect those numbers. This is phase two of the food guide, so there may be a follow up document specifically dedicated to cultural foods (and hopefully not just a translation) so we’ll have to wait and see. 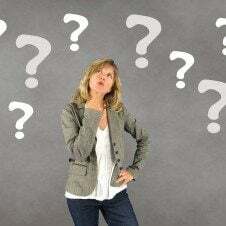 A common criticism of past Canadian food guides is the omnipotent influence food industries have had in past decision processes- specifically of the dairy, cattle and sugar industries. The 2007 food guide had a 12-member food guide advisory committee, and 25% of the people on the committee were employed by corporations that would be directly affected by the food guide recommendations. A tad biased, don’t you think? Like I just mentioned, the Canada’s dairy industry is not going to love the new Canada’s food guide. That’s because they’ve eliminated images of the classic glass of milk, as well as cheese, kefir, canned milk, powdered milk and instead the new guide includes yogurt as a protein source. To be fair, they do still recommend these foods (and I think they should since all of them have health benefits), but it’s not front and centre like in the old guides. Aside from the dairy industry, the meat industry will also not be a fan of the new guide. There are only two meat options presented in the hero image (steak and chicken) and in its place, there is more of an emphasis on plant based protein like beans and legumes. One thing that was unique about this new guide is that for the first time Health Canada did not meet privately with food industry representatives when putting together the food guide. 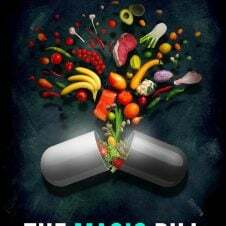 Of course, consultations for this guide were open to the public, so industry representatives could attend those sessions, but it was a nice change to see a guide developed by top health and nutrition experts and not invested interests with a profit driven lens. This is important to dietitians since this is ultimately one of the big criticisms of our profession in general. We all want Canadians to be eating the best, healthy food, so our recommendations should be driven first by science, and not dollars. I’m not suggesting that we don’t need dollars to make things happen. I’m also not suggesting that the old guide wasn’t driven by science (it was!). But I’m happy that it’s now even more clear to the public. Given all this, and a trend towards more plant based diets, it does beg the question of how this new food guide will impact Canada’s agricultural economy. Canada’s dairy and cattle sector play a huge role in our economy and provide thousands of Canadian jobs, so we may see some drastic changes in our food system as we shift to more sustainable agricultural channels. Many critics of the old Canada’s food guide argued that there was too much of an emphasis on meats and meat products. This wasn’t only coming from animal activist groups, but also environmental groups. Research has made it very clear that a lot of water and energy is required for meat production and cutting back can have a significant impact on greenhouse gas emissions. I like meat, don’t get me wrong, and I will continue to eat it in moderation. But the combination of new research on the benefits of plant-based foods and environmental concerns has led Canadians to the realization that there are a lot of foods out there that provide protein. Meat doesn’t always have to be the star of the plate and the new guide draws focus to that by emphasizing more plant based proteins. The food guide has shifted its philosophy from what food “groups” to eat to messages that seem more “macros” focused by using the plate method. That is, they suggest we fill half our plate with veggies and fruit, a quarter with whole grains and a quarter with protein (which now includes beans, legumes, meats, nuts and yogurt). I think that as we start to encourage more plant-based meals, and we’re realizing that we can get protein from a wide range of foods, this is the only way to organize nutrition messages that make sense. Whether or not this is enough direction, is another story so you can read on for my thoughts below. This is what I was really hoping to get out of the guide and I’m excited about how Health Canada actually delivered. It looks to me like Health Canada took a few tips from the Brazilian food guide which is pretty much the gold standard of food guides. Healthy eating is not just about the what to eat, but also about the when and how we eat. The guide takes this into account and provides some actionable strategies on how to combat the external triggers that create barriers to consuming a balanced healthy diet. YASS, so excited about this. This is a huge win for the mindful and intuitive eating community. I know firsthand the merits of mindful eating, and the wonders it can do for our health when our body and mind are in tune with our hunger and fullness cues. This is a strategy that we’ve been recommending for a long time now and with the significant rise in delivery apps and fast food dependence, we need to continue to emphasize the importance of cooking at home. Not only is it important for our health, but for families, cooking at home can help to expand and enhance a child’s food skills and overall food knowledge. It’s a win win! Makes sense, no? Unfortunately, diet culture is consistently trying to convince us that food is the enemy or merely just “fuel”. This coupled with the fact that we are so busy, eating has taken a back seat as a priority in most of our lives. Sitting down to a meal with gratitude and pleasure seems to be becoming an unusual luxury that most of us feel too guilty to indulge in. I’m hoping we see more campaigns around this concept but I’m really excited that this is even mentioned in the guide. Food is one of the few things we have to bring people together. When we share a meal, we communicate in a universal language of love. Food is a way to share traditions, culture, celebrations, lessons – hey, it’s even a great way to get our teen to open up about the boy she’s crushing on at school. These things don’t happen when we’re sitting in front of a TV, or texting on our phone, so I hope Canadians will take this one to heart. Since the guide isn’t being super prescriptive in its recommendations for serving sizes and portions, I think including some education on the importance of food labels was key to fill the gaps. Whether or not that education was enough, I will discuss below. But this is particularly important since we are expecting to see some major changes on our food label in the next four years like clearer serving sizes, new daily value % for total sugars, updated list of minerals and an enlarged calorie font. Food is political and there’s a lot in the nutrition world that we don’t agree on. And while the saturated fat one is still up for debate in a lot of circles, I would say that we’re all on board with Canadians keeping an eye on their sodium and sugar intakes. From the placement of foods in grocery aisles, to commercials heavily targeted to young children, food marketing is hard to avoid, and these guidelines by Health Canada is a step in the right direction to increase our awareness on how it affects our food choices. Especially in a world where social media has now become a marketing hot bed. 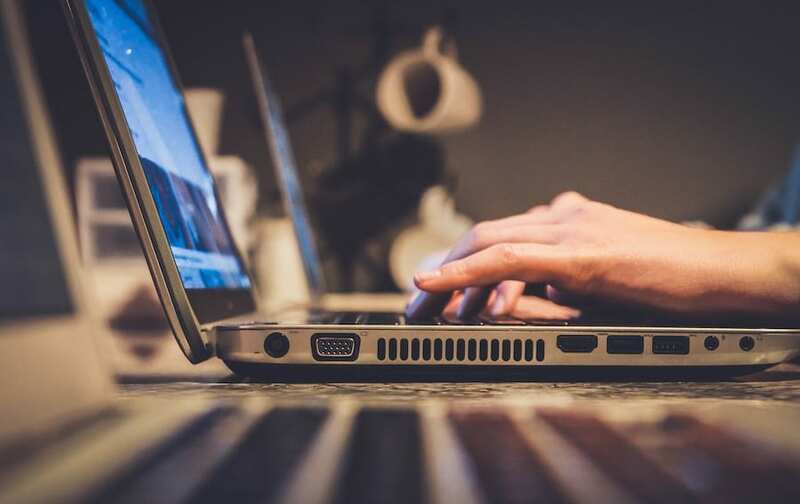 Without even noticing it, influencers are subtly promoting brands and we are making more online purchases than ever before. It’s important we recognize how these messages are influencing our purchasing behaviours. This may sound like a broken record for many RDs, because we’ve been sharing this message for a long time, but the new guide emphasizes filling half of our plate with fruits and vegetables. We’ve known for a long time the benefits of eating more fruits and vegetables in our diet but just telling people this may not be as effective as showing them. So we think communicating this message via a visual tool (like a plate) is a better teaching tool than just listing servings. I am loving the refreshing look of the guide. It’s clean, colourful and not too busy. We live in an Instagram era, so I do think the food on the guide needed to reflect that aesthetic and not feel like a Care Bear promo shoot. The old food guide encouraged Canadians to limit their alcohol intake because of its high calories and sugar. Sure, I mean, booze has calories. But the “danger” of too many calories shouldn’t be our only health priority. I think as Canadians become increasingly more interested in “wellness” and not just “weight loss”, it made sense to highlight some of the health implications of consuming too much like the increased risk of cancer. 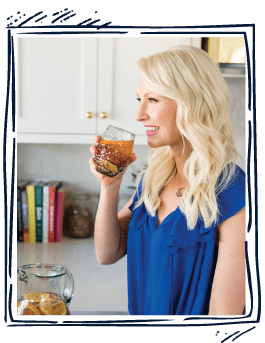 With so many sugar sweetened soft drinks on the market, consumers need to be reminded of the OG of hydration: water. 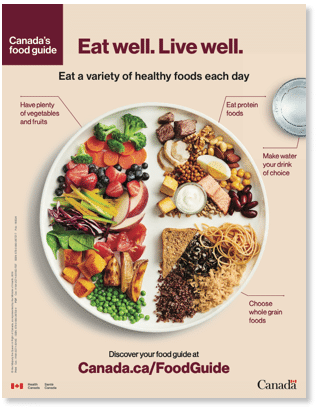 Unlike in its predecessor, the new Canada’s food guide has made this one of their key messages by presenting a glass of water on the front page. Now it’s time for some real talk. Don’t get me wrong, the food guide has got a new fresh look and it is a step in the right direction, but we’ve still got a long way to go. A lot of RDs are already complaining about the format of the guide, because the majority of the rich information is online. A lot of RDs don’t feel comfortable handing over this very general list of recommendations and pretty plate image to their clients and patients without doing a lot of counselling to unpack it. In order for the public to really understand its recommendations (i.e. what the heck is mindful eating? ), they would need to go through the Health Canada website and let me tell you, THAT is a task. I’m a millennial and spend my life online, and even when I KNEW what I was looking for, I found it hard to figure it all out. I mean, there are a lot of different buttons to click to read up on a single topic, and then to get back to the homepage required a lot of steps. I was frustrated just trying to get the information to write this post, so I can’t even imagine the average Joe is going to get it all. I know the new Canada’s Food Guide is just scratching the surface on the concept of Mindful Eating, but I do not believe this conversation has as much merit (or makes sense) without discussing diet culture and body positivity. It’s literally impossible to encourage people to eat mindfully when they’re still engrossed in diet culture. The page for this is very top level and explains the concepts and components of a food label (like what is the % daily value), but doesn’t give users any information on how to actually read them. It’s like saying “bake bread” but not giving a recipe. I would like to see more resources and visual examples for helping people unpack this because it can be a bit of daunting concept to grasp for beginners. Again, we live in a visual era and while the first page of the document is pretty and colourful, getting into the actual meat of the information hurts my eyes. There is just so much damn text! I would have liked to see more images and examples on each page to help people stay engaged. Cooking, eating, shopping, reading food labels all share a common theme: their inherently interactive activities- so why wouldn’t we inspire these activities by making the guide the same? The issue with past food guides was the abundant amount of prescriptive information that didn’t really make sense to most people, however for some populations and applications, it may be too broad. For example, it may make it more difficult to inform policy like healthy school lunch programs and hospital meals. It also puts a lot of onus on health professionals to properly teach the lack of information from the guide. I also think that while I’m really excited to see concepts like Mindful Eating included in the guide, these are admittedly really advanced, top level concepts that need a LOT more context, education and counselling to understand. I literally wrote a 300 page book about mindful eating and I still feel like I have so much to learn. I’m not really sure what can be done about this other than offering online programs or apps and access to more dietitians or programs (like Craving Change, for example), but I wanted to point that out. Since we are no longer given specific food groups, a little more distinction would have been nice with the plate on the front page. Not all vegetables and fruits are created equal. Some fruits contain more sugar than others, and some vegetables are more starchy than others. For example, I’m surprised that potatoes are still considered a vegetable and not a starch. I’m also unsure where to place avocados. I mean, if you were to fill half your plate with avocado, it probably wouldn’t exactly yield the intended macronutrient distribution the board was calculating. Same deal with the nuts and seeds in the protein category. Like, yes, they have some protein, but they’re no where close to what you’re getting from a piece of salmon or tofu. If we need to create some structure for people via the plate method to help people achieve the recommended macronutrient distribution, I would probably divvy it up a bit more, putting fruit with the whole grains (including potatoes) and naming this “starch or natural sugars” and adding some guidance on higher fat foods like nuts, seeds, avocados and added oils. With all of these foods combined now on one plate in this uber simplified model, it may be difficult for some people to acknowledge these differences. Like I mentioned earlier, Health Canada REALLY needs to look at our demographic. We are a country made up of so many rich cultures and our food guide needs to reflect that. Not to mention, in my experience as a dietitian, the demographic who gets the most use out of the food guide is newcomers to Canada. I would be embarrassed to hand this over without having ample time to unpack this with a new Canadian family from abroad. I am hoping future drafts address this by adding a more diverse selection of foods, but I do feel this particular guide is embarrassingly Eurocentric. Past food guides have continually failed to be accessible to a huge portion of Canadians with lower socio-economic status and this new food guide is no different. This new guide encourages Canadians to eat seasonally, to cook more at home with friends and family and fill half their plate with fruits and veggies. However, what about Canadians that shop at food banks and not farmer’s markets. What about Canadians that don’t have the time to sit down with their family at dinner time because they’re working at double shift. 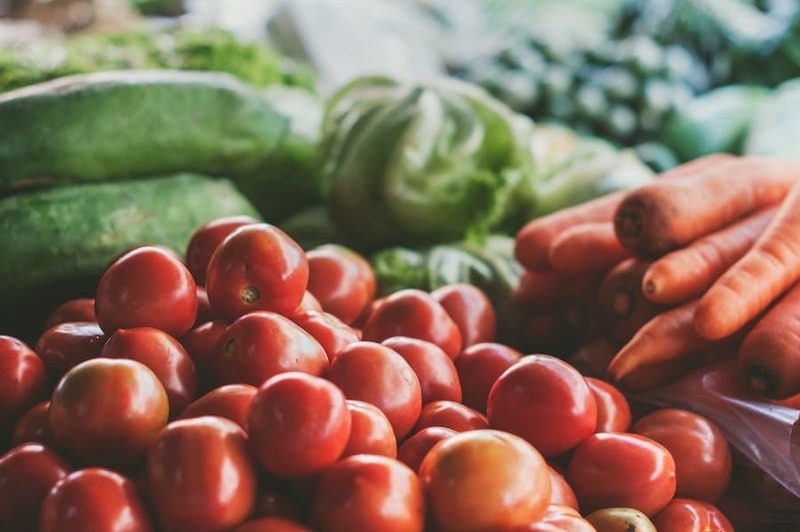 According to research conducted by the University of Toronto, 1 in 8 households in Canada is food insecure, which means approximately 4 million Canadians and 1.15 million children have trouble accessing a proper meal, let alone filling half their plate with veggies. This is a serious epidemic, and this new food guide does not address it. 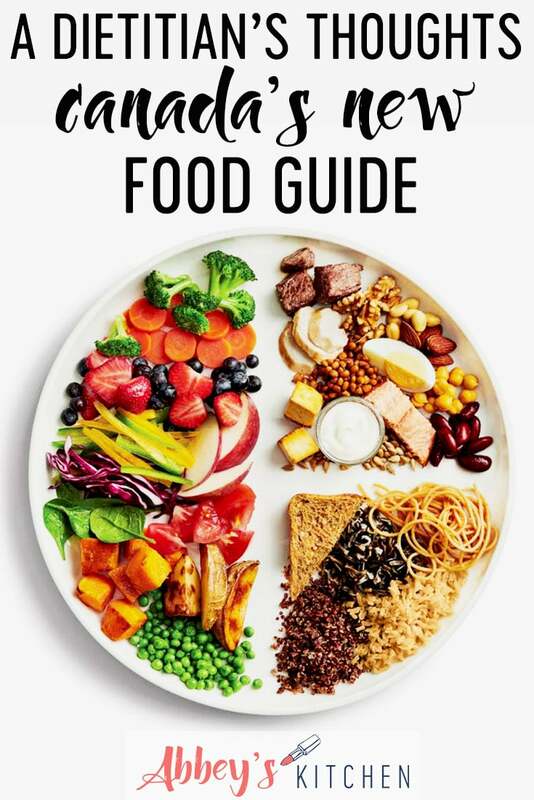 Health Canada has emphasized that this guide is less about the food and more about everything else. I kind of like that because in my experience, eating is actually rarely about the food. It’s about culture, social status, politics, religion, identity, love, connection and so much more. Having said that, I do think we have a long way to go to help Canadians unpack the recommendations in this document. So this is a good starting point, but this is where Dietitians come into play. There’s a lot of room for interpretation and diet flexibility (which is GREAT), but there’s also a lot of room for confusion here. So a small hooray for Canada for getting some big things really right, but I do hope for some improvement in future drafts. What do you think of Canada’s Food Guide? What do you like about it? What are your criticisms? I just discussed Canada’s new food guide with a sharp woman in her seventies. She is feeling very confused about how to translate this new guide into her everyday meal planning. 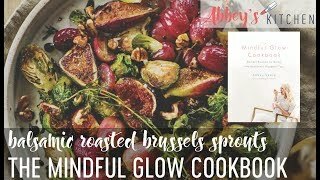 She especially is unfamiliar with it plant-based foods – I’m sure it would be beneficial to have some accessible and age-friendly resources that teach individuals how to incorporate these foods into their diets! Anyways, there are many positive changes, but I can definitely see why dietitians are finding they need to take a lot of time to unpack the information in this food guide with clients. All in all, great article Abbey! I really appreciate the changes that they made. Thanks for providing such a deep dive into the changes. I haven’t read too much into it yet but definitely need to. Looks like there’s some improvements though! Like you I had a lot of problems with the old guide but I find now I have a whole set of new ones with this new version. Diversity of foods being right up there. I too hope that the guides in other languages will be more representative, like some of the really old ones were (there were diverse rainbows at one point!). It’s not the most user friendly. Those statements, like you said, require a lot to unpack. I wanted a 1pager that a patient or school kid could put on the fridge. Give me the plate and principles on the front and a paragraph that explains each one on the back. My biggest beef though is the “eat protein foods”. What? I didn’t know we had difficulty encouraging their consumption. Did they forget the words lean or lower fat? A quarter plate of bacon or peanuts does not a healthy plate make. Would have loved to have seen “protein” broken down proportionally for animal vs non-animal sources. There is a difference between heme and non-heme iron. What about good sources of calcium, vitamin D, B12, complete proteins? Was there something truely wrong with recommending lower fat dairy and lean meats to people? Does the general public realize the nutrient difference between a nut juice and a fortified soy beverage? 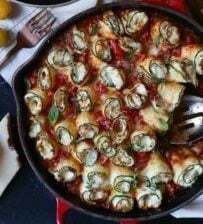 Overall, yes, better direction using the plate and looking at the othe aspects of food such as cooking and eating together. But I feel it fell pretty short in many other ways. Those are just my thoughts.